The Knicks' season begins in six days. (!!!) We couldn't possibly be more excited — finally, a Knicks team with barely an Isiah Thomas fingerprint on it! — so we'll be counting down the eleven most important Knicks twice a week until opening night on October 27. The best sign we can give you: Eddy Curry isn't among the eleven. Today: point small forward/"swingman" Danilo Gallinari. So here's a fun draft fact for you: Danilo Gallinari is the highest-drafted Knicks player of the last 23 years. Gallinari was picked sixth overall in the 2008 NBA Draft, the highest a Knick has been picked since Kenny "Sky" Walker in 1986. Can you believe that? All this franchise has been through, all the messes and dysfunction, and they've never picked higher than sixth? 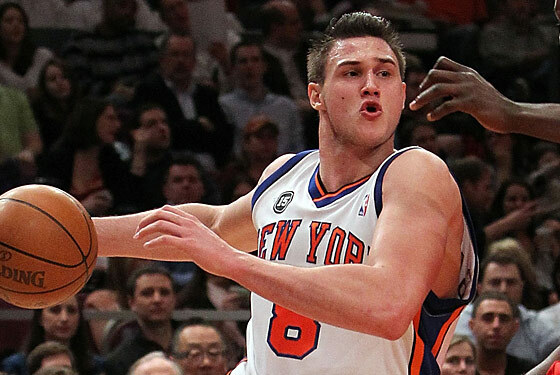 Danilo Gallinari is the closest thing the Knicks have had to a prospect since the mid-eighties. Which of course means the Knicks might trade him. Gallinari has what Basketball Prospectus calls an "elite skill": He can shoot the basketball. Now, Steve Kerr had that skill as well, but Gallinari is at least average (and usually more so) at everything else: He's a better on-ball defender than he's given credit for, he can drive the lane with more oomph than you'd think a guy with his frame would, and he even has some nifty, if unflashy, passing skills. He's not much of a rebounder, which is probably good, because if he banged too much with the bruisers underneath, his notoriously balky back might break in half. He improved dramatically between his rookie and sophomores seasons, is only 22 years old, and was hailed as a conquering hero when the Knicks were in Italy this preseason. If the Knicks hadn't signed Amar'e Stoudemire, Gallinari would be the team's best player by a large margin; he has more superstar potential than anyone currently on the roster. Basketball Prospectus says he's a "future All-Star." And as much as they love Danilo Gallinari, as much hope and care as they've put into him, as valuable a piece as he's been, as great of a player as he's going to be in three years if his back holds up ... if letting go of him is what they need to get Carmelo Anthony, well, you get the feeling their decision will end up being no decision at all.